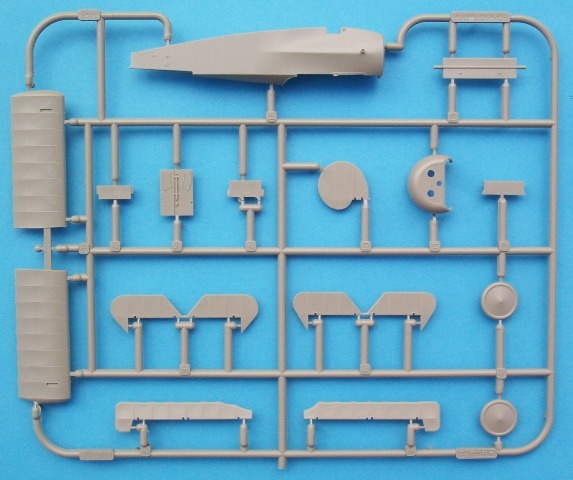 Contents and Media: See detailed descriptions for each kit item below. 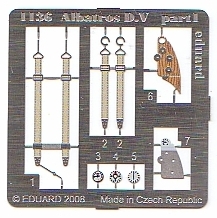 Price: USD$74.95 plus shipping available online from Eduard's website and in specialist hobby shops worldwide. 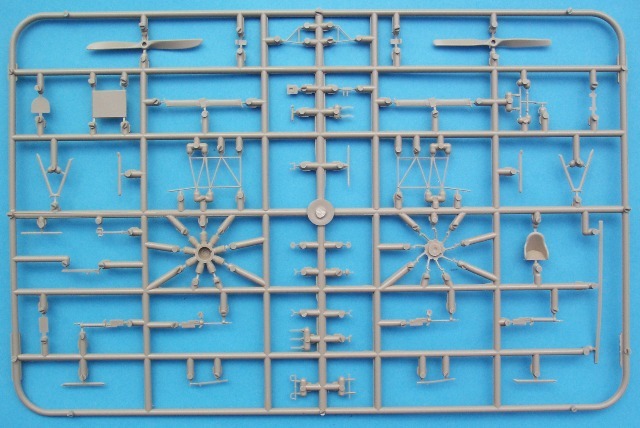 Advantages: The most comprehensive kit yet of the famous triplane. Lovely detail and accurate outlines present on both aircraft. Excellent use made of coloured photo etched parts for the aircraft and figures. Decals in perfect register with included stencil data. Three well cast detailed figures, a delectable Pour le Mérite pin and paper portraits of the two pilots. Disadvantages: Some anomalies on both aircraft, no doubt due to using out of date references. The Fokker has landed! Well…not just the triplane in this case. When a kit is advertised as being the best yet, the eyes of the world are suddenly upon you. So what has the modeller got to look forward to with this extravaganza? Well, in the initial incarnation of this boxing, the manufacturer has seen fit to make the first issue a “Limited Edition” release. 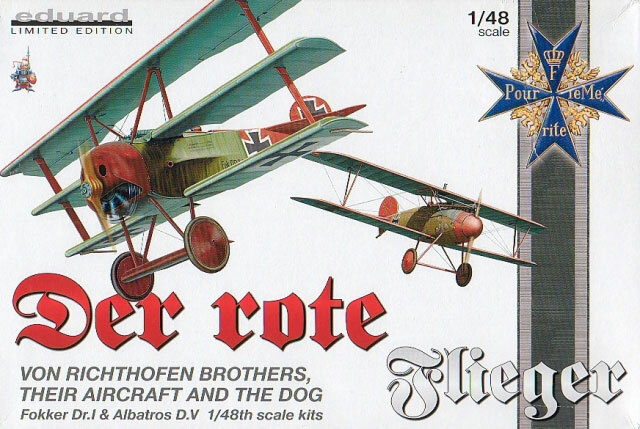 The modeller gets is presented with a Fokker triplane (either F.I or Dr.I), one Albatros D.V, three resin figures (one being MvR’s dog) and a 1:3 scale Pour le Mérite. But that’s not all; each aircraft is given the “Profipack” treatment as are the pilots, but more on this later. 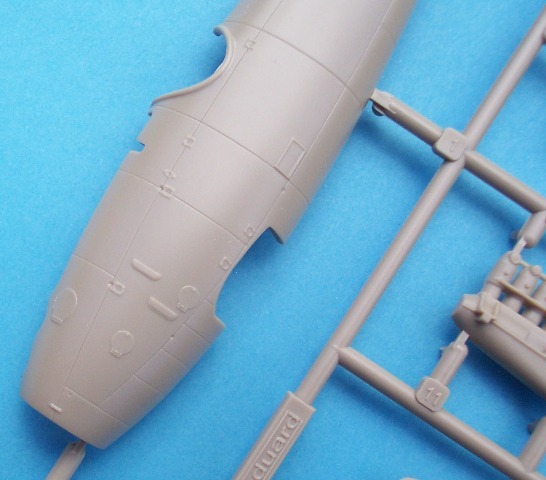 Three sprues of plastic greet the modeller for this much anticipated release. 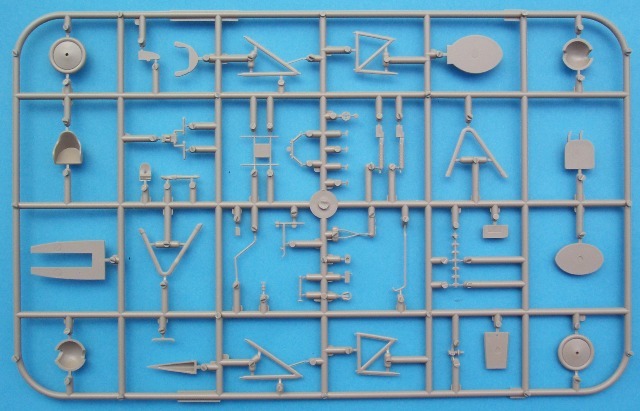 And just so you don’t think you’re missing out on anything, there’s a fret of p-e for this kit as well. As with the Albatros, the moulding is outstanding. Once again there will be no visible ejection pin marks on the finished product and all parts were free of any flaws. 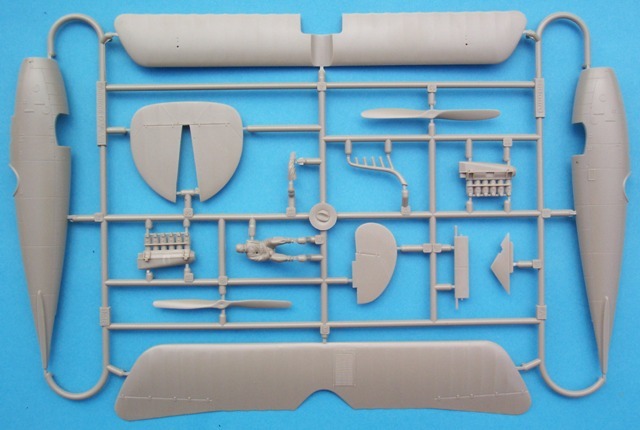 The plastic pieces number close to 80 and with a further 40 etched metal items, a compact fighter like the triplane will come in for some serious detailing. This German subject is not as simple as most people think. In 1:48 scale, to box both the F.I and Dr.I in the same package takes great care. All of the main differences are catered for here but there are still some areas that the modeller can improve on. No one is really sure on the exact layout of a triplane’s cockpit. Eduard has taken note of the information available and given the modeller plenty of items to make this area look busy. 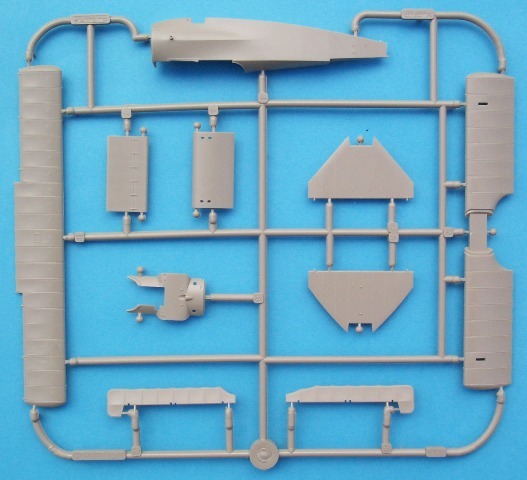 Floor, control column, compass housing, control stick, seat, ammo bins, gun mounts and rudder bar are the usual suspects. Also included are the seat frame and cushion, storage bag, rear “fabric” screen, spent cartridge collector, throttle control and magneto. The latter two items are provided as coloured p-e.
Coloured seatbelts make another welcome appearance as do the instrument dials. For those that prefer the latter in decal form, you have a selection of these as well. The fuselage halves include the plywood triangular shaped formers and a separate tubular frame completes the interior. After joining the fuselage together the middle wing and tailplane can be added. This is where you must make the choice as to whether you want to do the F.I or Dr.I as Eduard supplies both versions of this appendage. The rib detail on these flying surfaces is a slight departure from the usual Eduard practice. A closer look reveals the reproduction of rib tapes with subtle stitching showing through. A fine engraved line flanks both sides of this ridge to finish the overall effect. Other flying surfaces show the tape as an elevation only and it will be interesting to see the overall effect under a coat or two of paint. 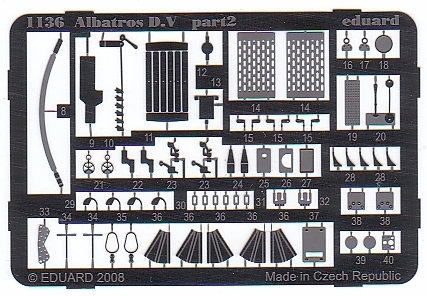 The ailerons are separate items which allow easy animation of these parts and also give Eduard the chance to maximize their moulds. They provide two styles, one having the single rib space trailing edge transition, the other portraying the double rib conversion. Sadly no allowance was made for the larger balance on the aileron that was seen on the pre-production F.Is and early Dr.Is. So for total accuracy on a number of versions, the modeller will have to do some skilful modifications. Speaking of the top wing, enthusiasts will quickly notice the perpetuation of an error that first appeared in a galaxy long, long ago. The celluloid inspection window is set too far back. It was placed over the rear of the spar for viewing purposes. Here the works number and date of spar manufacture could be read so the kit detail will need removing and another panel scribed. 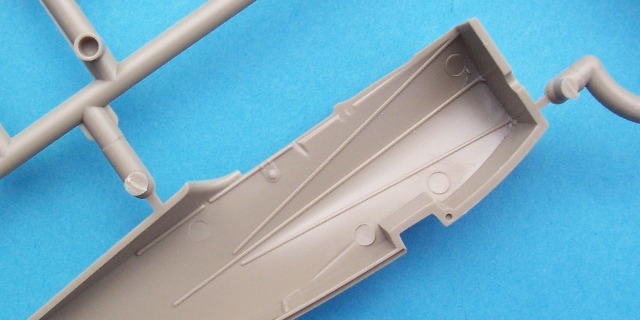 Another myth propagated on this kit is the appearance of fasteners seen on the undercarriage wing. This assumes that the lifting surface could be split for maintenance purposes but this was not the case. A quick sanding of these details will put things right. A rectangular opening was seen at each end on the under surface to provide access to the bungee cords. These may be added while you’re fixing this area. The lower portion of the cowl differed from the F.I to the Dr.I and Eduard take care of this with a choice of etched metal plates. 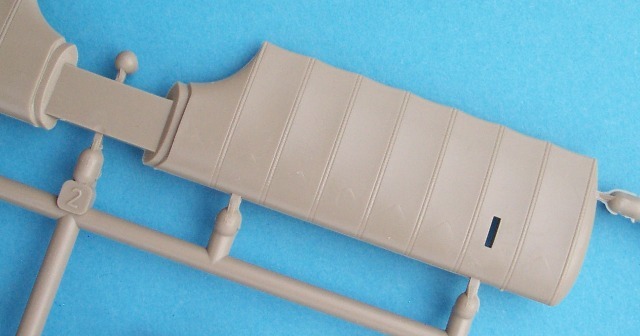 They also double as representations of the hinged access panel found under the fuselage. It’s good to see that an attempt has made to capture the “lip” on the faceplate, a feature often missed on kits of the past. After careful study of photographs, some modellers will want to enhance this for their chosen option. Other p-e items add extra detail in the form of machine gun jackets, cowl strap, and engine “harness”. 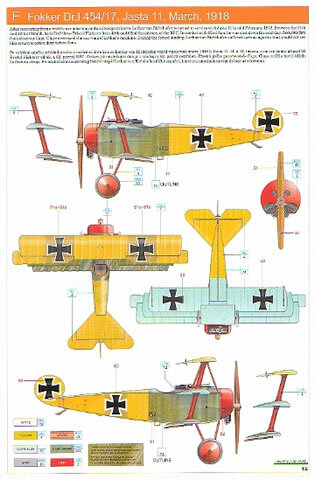 Six difference aircraft are catered for on the decal sheet. The perfect registration of colours continues as does the welcome thin carrier film. Fokker F.I 102/17. This is one of the pre-production machines that were given to MvR; the other went to Werner Voss. He scored two victories in this aircraft, one each on the 2nd and 3rd of September 1917. Kurt Wolff was killed in this triplane by RNAS Camels while MvR was on leave. Fokker Dr.I 127/17. Manfred’s 71st, 74th, and 76th victories were claimed in 127/17. These are believed to be two Sopwith Camels and an AWFK8. The colour scheme of this machine changed to a point where it had various portions panted red in much the same way that 152/17 was. Fokker Dr.I 152/17. Three victories came to MvR in this triplane. A Bristol F2b and two Camels approved to be his 64th, 65th, and 66th respectively. The aircraft survived the First World War and was later exhibited in the Berlin Zeughaus Museum. Sadly it was destroyed in bombing raids during the second great conflict. Fokker Dr.I 425/17. This is the machine in which MvR lost his life when chasing Lt. Wilfred “Wop” May of No. 209 Sqn RAF. Here it shows the earlier scheme worn by this machine. Two camels fell before its guns which counted as victories 79 and 80. Fokker Dr.I 425/17. 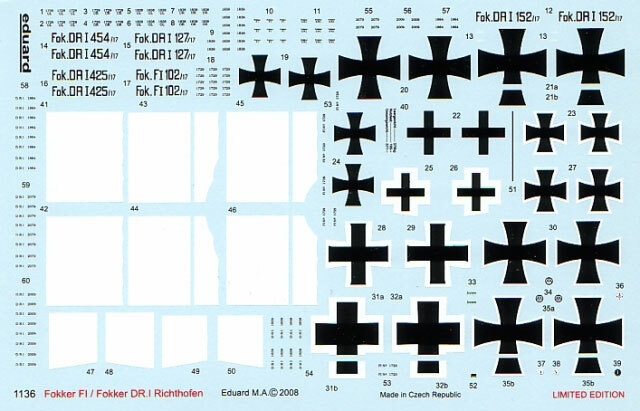 It wears the final version of markings after further reduction of the black crosses which previously didn’t quite meet the specified ratios of the March 17 directives. Note that the wing crossed had not been completed by time this aircraft was lost. 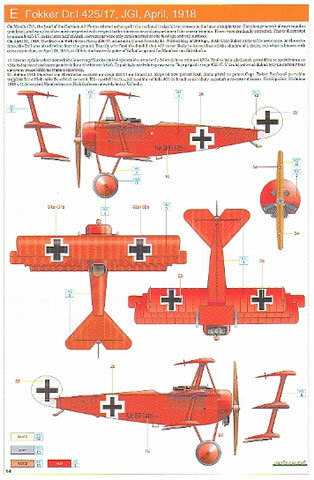 Fokker Dr.I 454/17. 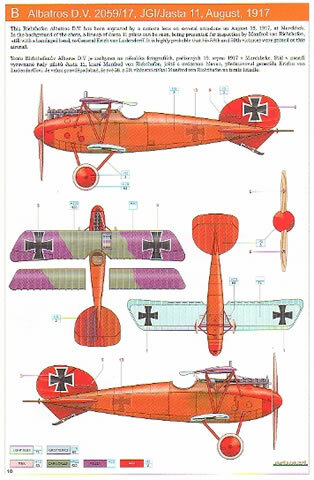 This is Lothar’s colourful machine and one in which he was shot down. A Bristol fighter of 62 Squadron was singled out by Richthofen for attack but the enemies observer, Captain H Claye managed to do the damage first. 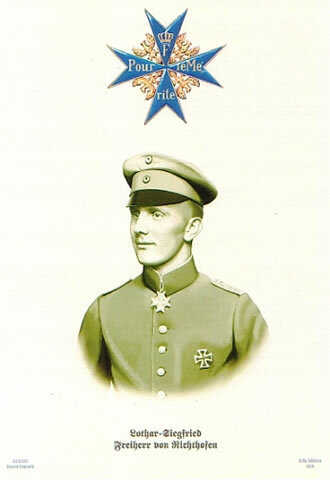 Lothar suffered a badly broken jaw which kept him out of action for about four months. There is plenty of debate as to the true colours and of these aircraft. The underlying base colour as well as the streaking has been the subject of much discussion. Eduard’s suggestion is just one of many options although their recommendation of “dark olive streaks over light olive or pale blue surface” for all of the streaked aircraft will raise a few eyebrows. There is plenty of stencil data and this is a real bonus for the modeller. Logos for the propeller are not forgotten and here the printing is crisp and legible. The positioning of these items varied between the F.I and the Dr.I and the instructions make no allowances for this. So again it is a case of checking your references carefully to get this right. 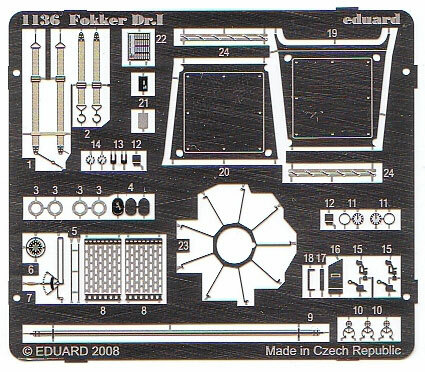 This is the faithful Eduard kit of years gone by and it still looks as though it was released yesterday. The mouldings have not suffered at all and each piece was free of any blemishes. 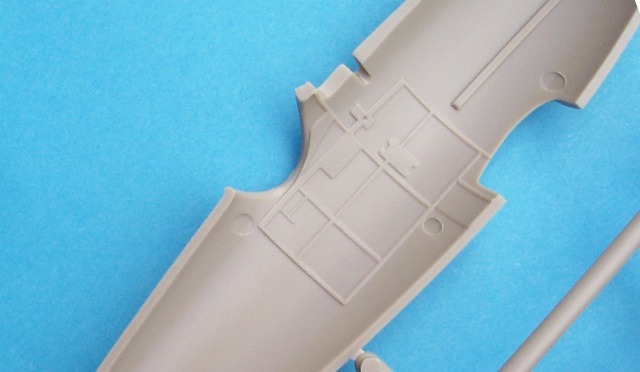 With nearly 60 plastic parts and two photo-etched frets (one coloured), there is plenty of detail to add to this aircraft. 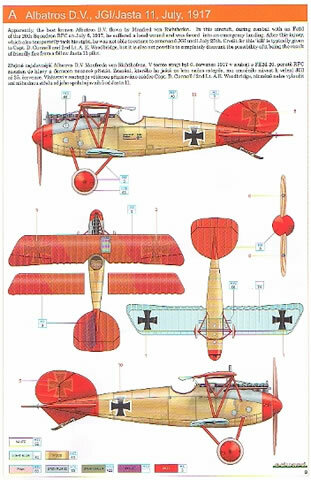 The outline of the wings and fuselage beautifully match Ian Stair’s general arrangement drawings found in the 1991 edition of the Windsock Datafile Special “Albatros Fighters”. These otherwise excellent plans have a couple of mistakes regarding the fuselage inspection plates. The kit copies the extra cover displayed on the starboard side but fortunately ignores the starboard profile by placing those items in their correct locations. The foot step can also be scrapped off and relocated further aft. Strangely this was placed in the right spot on one of Eduard’s earlier pressings of the Albie. The cockpit area is well appointed with part of the interior structure moulded on the inner fuselage halves. One then adds a plethora of items, including coloured instruments and seatbelts, found on the aforementioned fret. These metal parts also have a hand in enhancing the exterior. Machine gun jackets, aileron control horns (with covers), radiator shutters, cable entries, lifting cables and various other fittings all combine to add a touch of finesse to the subject. There are over sixty five parts to apply if you dare. Despite the wealth of items found between the main halves, the fit is exemplary. The wings are done in one piece which eliminates the problem of setting the dihedral of the lower item. There was no distortion of these components and the trailing edges were commendably thin. All surfaces feature a subtle depiction of the ribs but the purist may want to add the characteristic “washout” present at the out end of the ailerons. One area that does need addressing is the squat appearance of the finished product due to the rather short undercarriage legs. This will prove problematical but not impossible to correct. A useful sheet of masks is supplied that will significantly ease painting. These are not the recalcitrant vinyl types seen in the past and adhere well without pulling off the existing paintwork. One set covers the fuselage to allow the engine panels to be painted, while others cater for the wing radiators and wheel covers. Being a “Richthofen” boxing, it no surprise that three of the four options cater for Manfred himself. 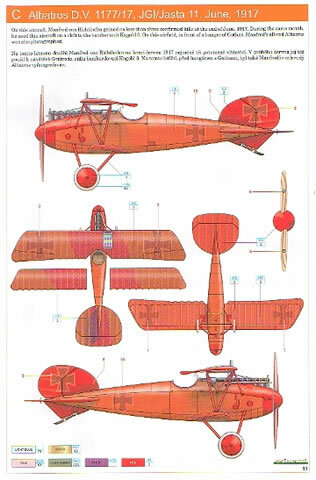 Albatros D.V, serial unknown, Jasta11, July 1917. Following an encounter with FE2d aircraft of No.20 Sqn RFC, MvR crash landed this aircraft near Wervicp on July 6 1917. Albatros D.V, D.2059/17, Jasta 11, August 1917. In this aircraft MvR shot down his 58th and 59th victims. 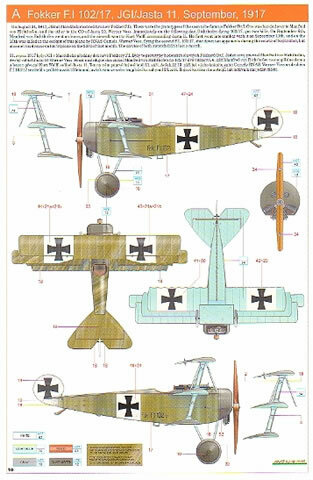 Albatros D.V, D.1177/17, JG I, June 1917. MvR could have had as many as four victories in this Albatros. Sources have credited claims 54, 55, 56 and 57 to this overall red machine. Albatros D.V, serial unknown and flown by Ltn d R Franz Müller, Jasta 11, July 1917. This interloper is the exception to the MvR group. 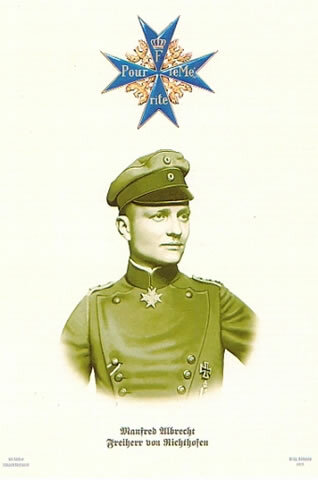 Müller only had two victories and was killed during the test flight of a Fokker biplane. 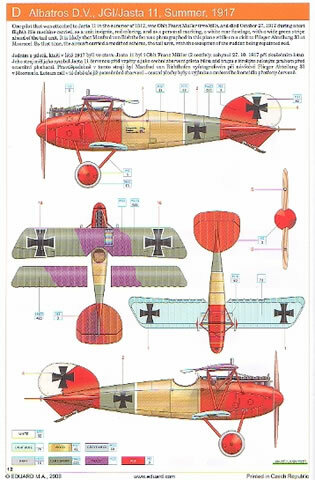 Due to the lack of markings on these aircraft the decal sheet is quite modest by Eduard’s standards. The quality though is up to the usual high standard with thin carrier film and perfect registration. Although coloured instrument dials are found on the photo etched fret, modellers will be happy to discover that more such items are found on the decal sheet. There are a few extras that Eduard has included to celebrate this initial release. 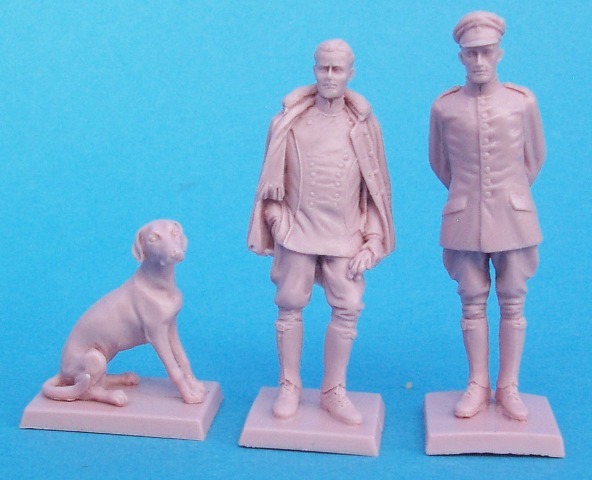 One is a set of figures that portray Manfred von Richthofen, his brother Lothar and Moritz, the Baron’s faithful Danish hound. 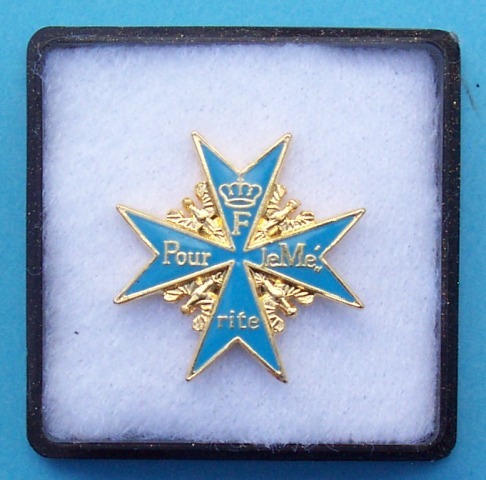 A fret of coloured p-e even caters for the Pour le Mérite, Iron Cross and Pilot’s Badge! These resin castings are superbly done and require only minimal cleaning up. The detail is exquisite and the poses are very natural. It might be best that they are not posed side by side as the respective height differences between the brothers is much more than has been modelled. Nonetheless they represent outstanding items for display next to their individual aircraft. The1:3 scale Pour le Mérite is also a gem. It’s actually a pin and can be worn on whatever piece of clothing you desire. You’ll easily spot the people who bought this release at your next club meeting! Not to be forgotten are two portraits of the men themselves. They are printed on standard paper stock with a biography of each pilot on the reverse. 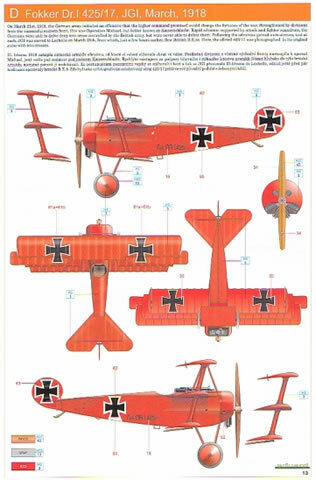 Ever since it was announced that the Fokker triplane was getting the “Eduard” treatment, fans of this aircraft were salivating like the proverbial Pavlov’s dog. Many will feel put out that the initial boxing puts this subject out of their financial reach. They will have to wait a little longer for a “lone triplane” while others will rejoice in the many extras contained in this release. Whatever the marketing philosophy there is no doubt that the contents are superb. 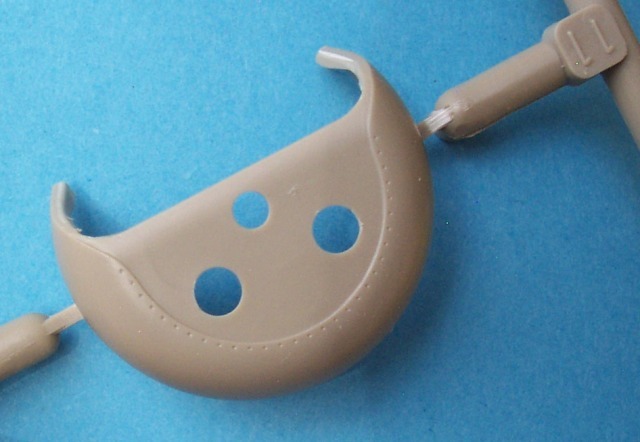 A high quality model will result from the box and as expected with this manufacturer, the fix is exemplary. There are some anomalies that the modeller will need to address and it is unusual that these slipped through Eduard’s research. It’s nothing that can’t be put right with a little patience and most buyers probably wouldn’t notice. We can no doubt look forward to the Fokker triplane in many more guises and with the range of markings possible, this will be a real treat.